Capt. Wayne Thompson and his fishing partner "Red" Weidenger were searching for 'ahi on the 19-foot KIANA outside of Waianae when they hooked an ono on a chrome-headed lure. 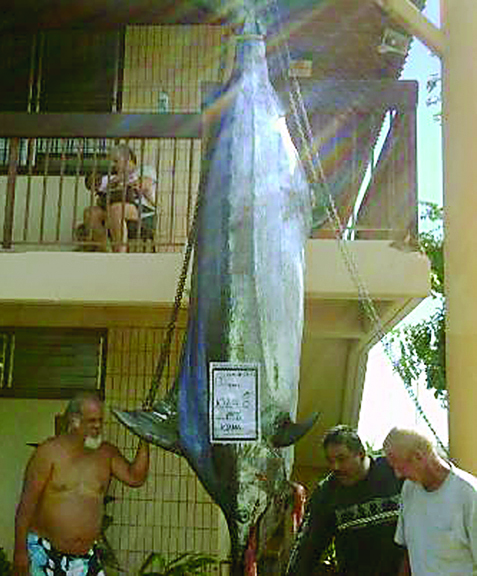 They boated the 30-pounder then dropped the lure back and later hooked their monster blue marlin on the same lure. The two 60-plus-year-old fishermen fought the fish to the boat then borrowed some muscle from the TRACI LEE to get her aboard. Lenny Black Alejado jumped in and swam over to the KIANA to provide that muscle. The makule anglers used a 50-class Harnell rod and 14/0 Everol reel to subdue their behemoth from the diminutive 19-foot Reinell.